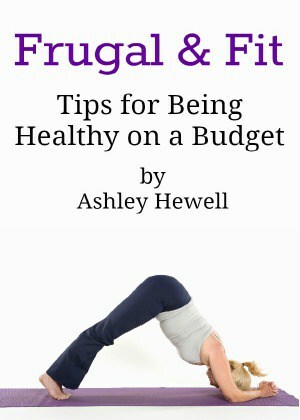 Here is a great new giveaway you can enter from Whole Mom. You will need a facebook account to enter. You can win $150 store credit to Intentionally Me Hand Stamped Jewelry. Entry is super easy and you have until July 31st. This is a great prize, they have some cute jewelry you could get. With $150, you could fill up your jewelry box! Here is a great new sweepstakes you can try to win! Enter the Arnicare Adventure Sweepstakes to win a trip to the Grand Canyon or a Caribbean Cruise. One GRAND PRIZE WINNER will choose either a five-day, four-night trip for four to Red Rock State Park and the Grand Canyon or a six-day, five-night trip for two on a Carnival Western Caribbean Cruise. One WEEKLY WINNER will be chosen every Friday and receive Arnicare Gel 2.6 oz, Arnicare Cream 2.5 oz, Arnicare Arthritis Tablets, Arnica 30C oral pellets, and an official Arnicare t-shirt and BPA-free sip and spray water bottle. Here are two new giveaways you can enter. You know I love entering giveaways :). You will need facebook to enter these two. You can win a free year of coffee from Zavida Coffee. I know I could use this one. You can enter through June 1st. There will be one grand prize winner and 5 runner ups will receive a Zavida coffee bundle pack. 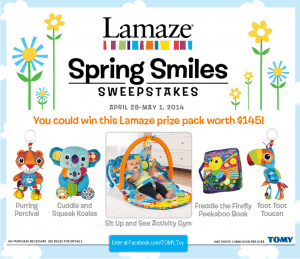 Enter The Lamaze Spring Smiles Sweepstakes! Parents, does your baby have an adorable smile? 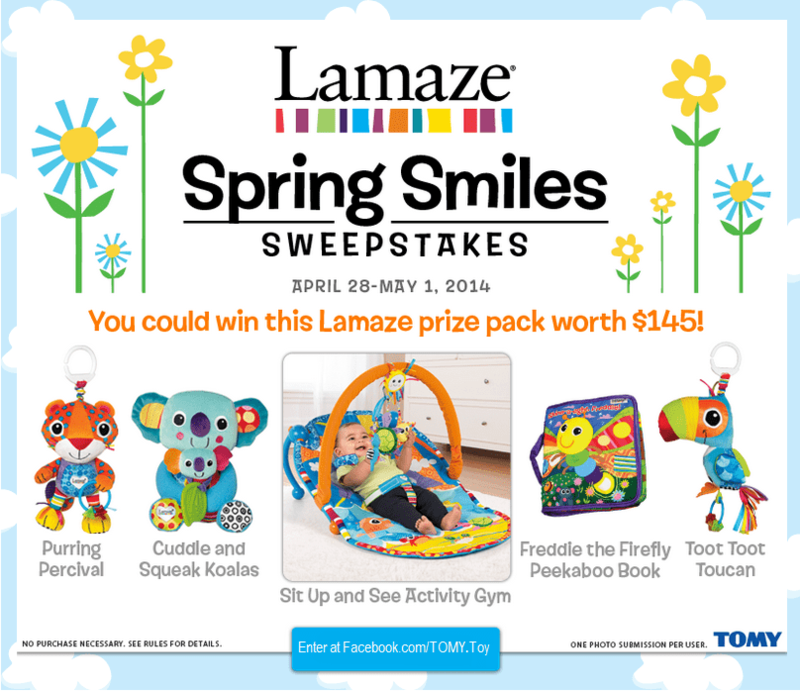 Through Thursday (May 1), enter the Lamaze Spring Smiles Sweepstakes at http://a.pgtb.me/xdmhfS, and you’ll have the chance to win a fabulous prize pack that includes brand new spring toys from Lamaze. Just upload a photo of your child with any Lamaze toy, tag it with #TOMY and #Lamaze, and ask your friends to vote for your photo. Easy Canvas Prints Photo Contest= Enter to Win $300 Easy Canvas Prints Credit! This is the time of year where we take A LOT of pictures! I have been able to turn many of my fondest memories into beautiful works of canvas art using Easy Canvas Prints. They are offering an exciting Easy Canvas Prints photo contest where you can win a $300 credit! All you have to do is upload any photo you would like to print on canvas to gift to someone this holiday season to enter. People will enter the contest through the dedicated blog post, and the photo with the most votes will win a grand prize of a $300 credit to Easy Canvas Prints! The 2nd and 3rd place winners will win a $100 credit to Easy Canvas Prints as well. But here is the best part, just for entering everyone will receive a 60% off Sitewide + Free Shipping coupon code! So everyone is a winner! You can use your code to make some amazing Christmas gifts. I have used Easy Canvas Prints before and I have never been disappointed.